Not autumn - but spring! We'll come back to the mosses, fungi and lichens another day. trees of the same kind are leafing at different times - sometimes within the same garden - why? was Venice built on alder? is ivy inevitably bad for a tree? 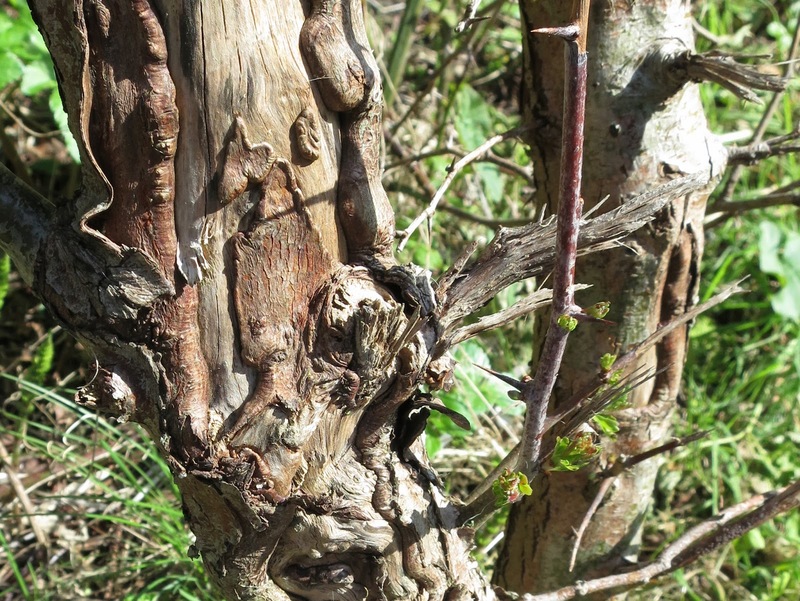 are hawthorn leaves and buds really as tasty as bread and butter? April, for many trees, will be a month of particular change. By May - will all the snow have melted? Will blossoms have come and gone? Will southern leaves have fallen? How many bees will we have seen? The next Tree Following link box will open at 7am (UK) time on 7th May and close 7pm (UK time) on the 14th. 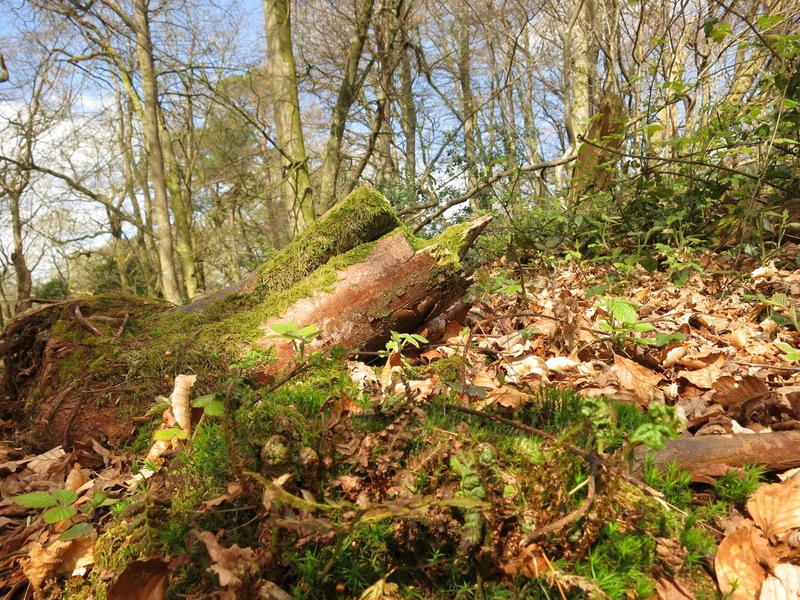 Since the last post I've been pottering around Thorncombe Woods in Dorset and The New Forest in Hampshire - enjoying the mosses and lichens and fungi and flowers and insects . . . and (apart from a few familiar flowers) not knowing what any of them are. Some will appear in later posts - whether identified properly or not! In the meantime, I keep finding myself looking at things other than what I've set out to find. Aprill 11th 2014 - See the pollen sack? I've been trying to understand how a bee puts pollen in its sack - I think it's like this . . . With its front legs it churns pollen into the air so it lands on the hairs of its back. 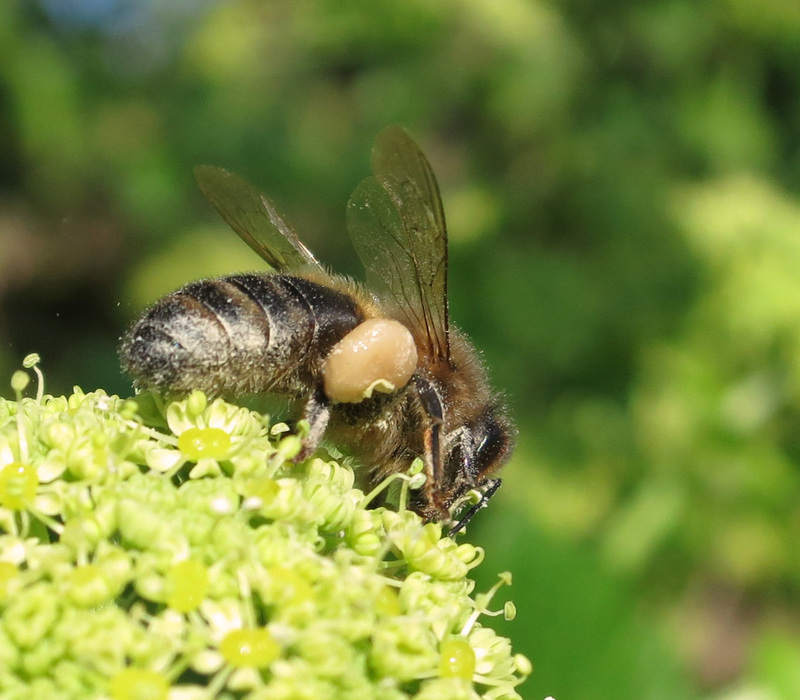 It then licks the feet on its middle legs to make them a bit sticky, picks up the pollen with them and pops it into the sack which is attached to its back leg. Its back leg works as a pollen press, bending to squash the pollen tight so it's delivered back to the hive in the form of compressed pellets. Bee experts - please mark my homework! Is this a right description? 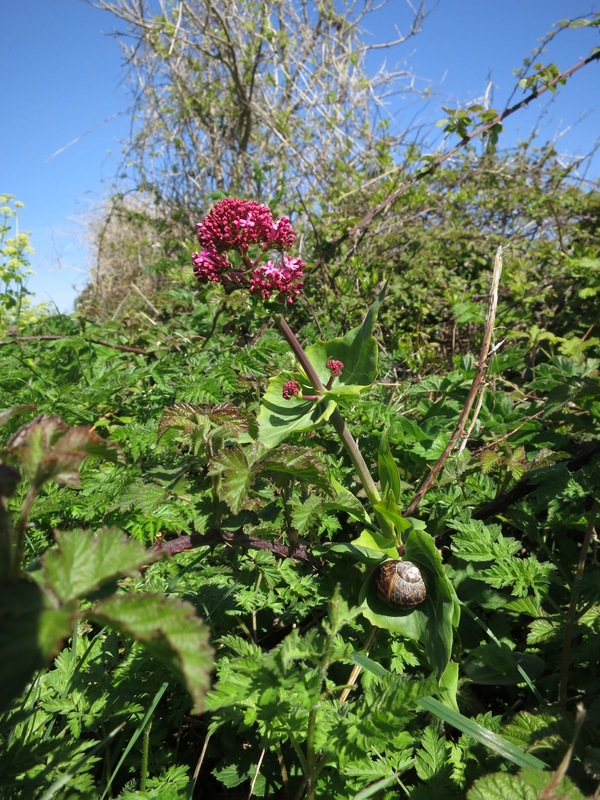 (do you see it on the Red Valerian (Centranthus ruber)) . 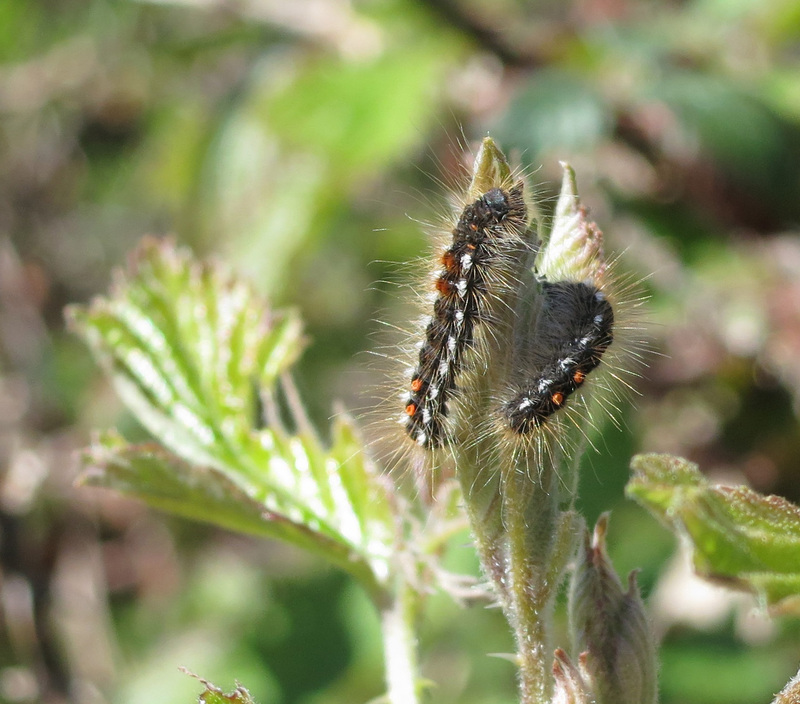 . .
and not far from the butterfly, caterpillars of the Brown Tail Moth (Euproctis chrysorrhoea) recently emerged from their gossamer tent and sitting around on brambles. Which is where things go wrong. I never delete anything from my camera; ever; in case I delete something I don't want to delete. I'm good at mistakes. But videos take a lot of space, both on the card and on my laptop so . . . having taken several videos of caterpillars going in and out of their nest, and deciding one was so interesting I kept watching it over and over . . . and having decided it was so interesting and so clear and the camera held so steady I couldn't possibly want any of the other tries - I deleted it. I suppose there's virtue in consistency. Hey ho. Never mind. If it's not a bluebell, it might be bark; if it's not bark, it's a snail; if it's not a snail, it's a bee; if it's not a bee, it's a flower; if it's not a flower, it's a butterfly; if it's not a butterfly, it's a moth . . . or a twig . . . or a - there's always something to see! Identify Your Bluebells (Natural History Museum - take a look in the sidebar of that page for more bluebell info. 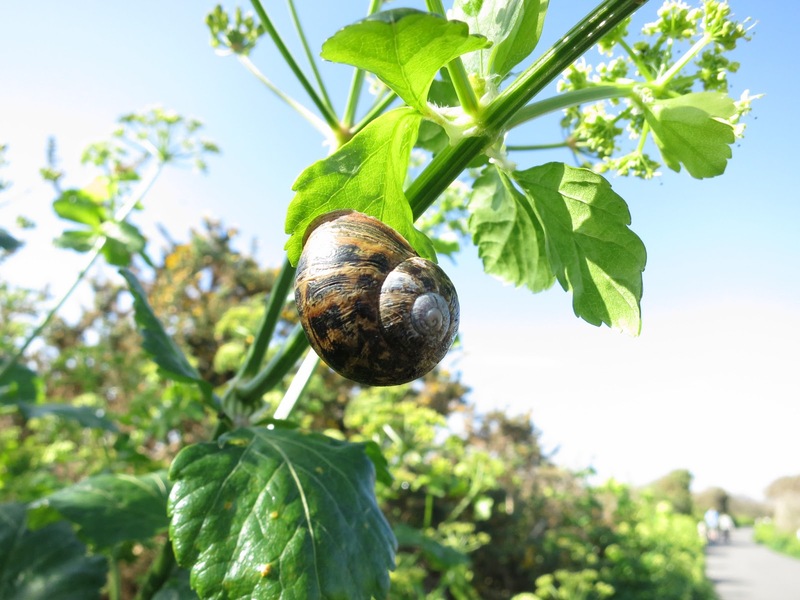 Key To Snails Which Live in and Around Bristol! Brown Tail Moths - This Wikipedia entry is interesting on two scores. (Probably more but there are two which stand out for me.) First - it shows what the moth itself looks like (very pretty) and says to look out for it in July and August. Second - it shows the impact the hairs of the caterpillar have on human skin. Which leads to the question - why did the woman in the picture have caterpillars wandering around on her neck? Hello CT. 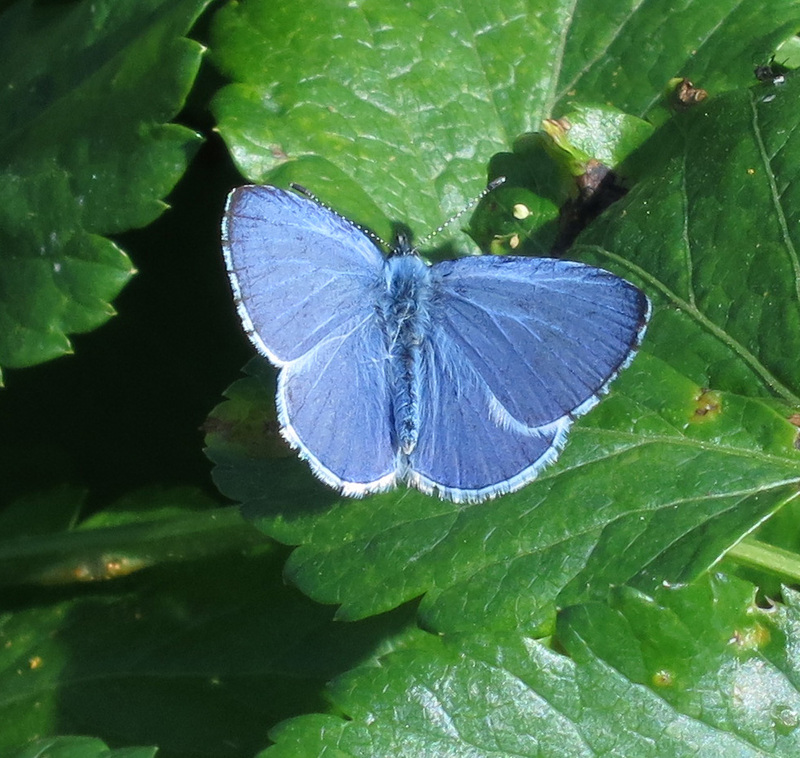 These blue butterflies are cheerful - but what I would have liked to have taken pictures of are the large yellow butterflies on the outskirts of Thorncombe Woods. I chased them up and down but they wouldn't settle. Never once did one settle anywhere near me. I've just been taking a look at the moth site you contribute to. Moths, I think, are more characterful than butterflies. Hello Rowan. I agree, the caterpillars are very pretty - even prettier than the Lackey moth caterpillars which emerge from similar tent-like structures. (Fatter too!) I'm now looking forward to seeing the moths. Hopefully there will be some roughly where I took the caterpillar pictures - but . . . ? Hello Juliet. But you've seen peacocks! An interesting, and informative, post with useful links. The tree following posts are amazingly varied, and I am checking the buds on my hawthorn daily so that I can taste the with the young leaves, which is just weird! Am in awe of your photographs, I am useless at getting pics of critters. Have you noticed vast numbers of ladybirds down your way? I kept coming across them today whilst weeding, mostly really small. Morning, CT. Yes, with a moth, you can sometimes come back two days later and it's still there - or moved a few inches. I hope you are alright after your tangle with a bramble patch, It can sound funny but be painful. Hello Janet. You ask about ladybirds. The opposite here - I have seen only one so far. (Though it too was a small one.) Hawthorn here hasn't advanced very far yet - though some trees are further ahead than others. The blackthorn blossom was dreadful - thin and tatty. I hope hawthorn will be more abundant. In some years it can be quite dramatic - like white tunnels in spring leading to great domes of red in the autumn. But although ever year is different this one is more different than others (!). The trees have had such a terrible wind battering. 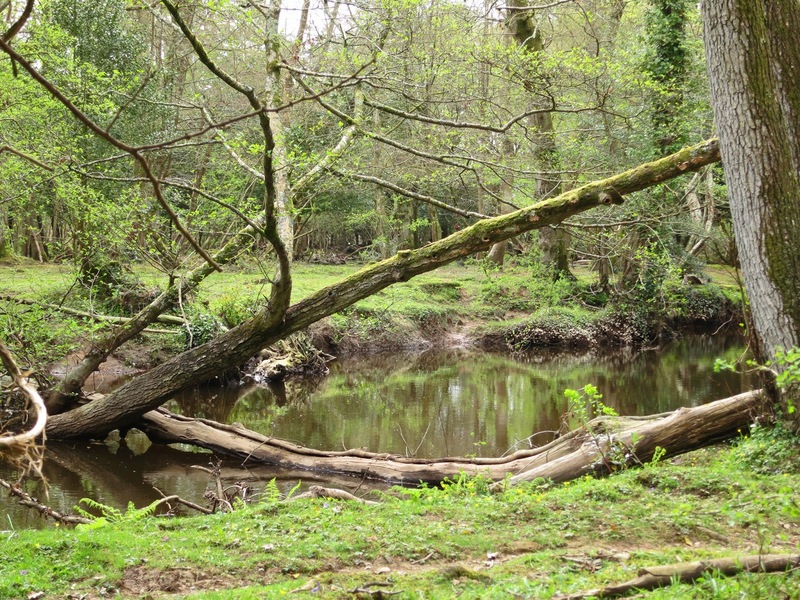 Great post and photos, Know what you mean about one thing leading to another, had gone looking for Green Woodpeckers this week, found a Pill Millipede, under some rotting wood. Never seen one before...amazing insect. Hi Lucy, I really like the photos your taken - especially the one of the bee. Pandora file recovery can be a useful tool for recovering deleted files. I'm so glad the tree following meme is gathering participants--it's really fun to compare our trees around the world! I liked your video. For some reaons my videos always look great on my phone and on my computer, but they look grainy and horrible when I try to upload them. Must be doing something wrong... Those snails in the trees and the Hawthorne trunk are fascinating!